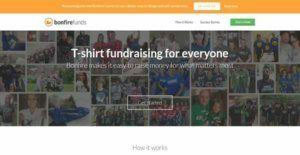 Bonfire is a fun and unique online fundraising tool that enables nonprofit organizations to promote their cause and mission, and raise money by selling custom t-shirts to supporters online. The good thing about this is that they can do this without the need to pay any upfront fee and worry about inventory. The fundraising solution can be used by nonprofit organizations that are collecting donations and raising funds for causes like protecting the welfare of children with special needs and cancer, saving the environment, and advocating the interests of grassroots communities. Bonfire allows nonprofit organizations to create designs for the t-shirts they are going to sell using its free online shirt design tool. They are also given the option to upload their own t-shirt designs into the platform. In order for them to sell t-shirts and raise money, they need to set up a fundraising campaign, letting them create and customize their own fund page. Once they are able to sell the minimum quantity of t-shirts required for printing, the t-shirts are printed and shipped to the people who ordered them. The vendor then sends the profits to the organization. One of the fun and exciting features offered by Bonfire is its online shirt design tool. This tool is used for creating t-shirt designs that the supporters of the organization will love. In order for users to design awesome t-shirts or hoodies, the tool is built with thousands of design elements, fonts, and graphics they can choose from. What’s great about this is that they can use the design tool for free. Bonfire permits users to set a sales goal before they launch their fundraising campaign and sell t-shirts online. They can define the amount of money they need to raise, the quantity of t-shirts need to be sold to reach such amount, and the price of the t-shirts. Doing this, they will be able to encourage more supporters and maximize their profits. The online fundraising solution has a feature that enables organizations to set up their own fundraising campaign within its system. Here, they can build a fund page for their organization and customize it. Among the things that they can add to the fund page are videos, photos, and website links. As they customize their own fund page, they can indicate a short summary of the fundraising campaign and how long the campaign will last. Spreading awareness is another feature delivered by Bonfire. The online fundraising tool helps users expand their network of supporters by allowing them to share their own custom fund page on Facebook, Twitter, and Pinterest. They are also provided with a fund page link which they can attach to the emails and messages they are sending out to supporters and community members. They can reach out to a wider audience and take advantage of the power of the crowd to sell more t-shirts and raise more funds. Bonfire takes away the pain associated with fulfilling orders, managing payments, and handling inventory. This is because the vendor (Bonfire Funds) is the one who will handle all of these, permitting organizations to focus more on promoting their cause, growing their supporter base, and raising money; and less on sales, inventory, and shipping processes. Bonfire Funds makes sure that nonprofits are able to ship high-quality, top-notch, and professional t-shirts to their supporters. In fact, the vendor can quickly print the ordered t-shirts and deliver them directly to supporters of the organization. When it comes to collecting profits, users also need not worry about that, as Bonfire Funds can send the profits to the organization on time. If you are interested in Bonfire it might also be a good idea to examine other subcategories of Best Fundraising Software collected in our database of B2B software reviews. Since each organization has particular business needs, it is prudent for them to abstain from searching for a one-size-fits-all ideal software solution. Needless to say, it would be futile to try to find such a platform even among market-leading software applications. The intelligent thing to do would be to jot down the various important elements that need consideration such as key features, finances, skill levels of staff members, company size etc. Then, you should do your groundwork thoroughly. Read some Bonfire reviews and check out each of the other apps in your shortlist in detail. Such exhaustive groundwork can make certain you discard ill-fitting platforms and choose the app that presents all the aspects you need for business success. How Much Does Bonfire Cost? Bonfire is a free online fundraising platform. Thus, you can enjoy its features and capabilities with no enterprise pricing plan to worry about. Nonprofit organizations and fund organizers are only charged with a base cost which is deducted from the selling price of every t-shirt they sold. The base cost covers all costs associated with printing your t-shirts such as fabric, the screen(s), ink colors. and credit card processing fees. Your actual base cost is calculated based on the total quantity t-shorts sold during your fundraising campaign. The more shirts you sell, the lower your base cost is. Also, since the platform can be used for raising money not only through selling t-shirts but also through collecting different types of donations, it permits your supporters to add donations even if they don’t purchase a t-shirt. In this case, additional donations are charged with 8% fee. We realize that when you make a decision to buy Fundraising Software it’s important not only to see how experts evaluate it in their reviews, but also to find out if the real people and companies that buy it are actually satisfied with the product. That’s why we’ve created our behavior-based Customer Satisfaction Algorithm™ that gathers customer reviews, comments and Bonfire reviews across a wide range of social media sites. The data is then presented in an easy to digest form showing how many people had positive and negative experience with Bonfire. With that information at hand you should be equipped to make an informed buying decision that you won’t regret. What are Bonfire pricing details? What integrations are available for Bonfire? If you need more information about Bonfire or you simply have a question let us know what you need and we’ll forward your request directly to the vendor.